Hémorragie jonctionnelle: Croc ou Sam Tourniquet ? Garrot jonctionnel: CROC et SAM ? Kragh JF et Al. J Spec Oper Med. 2014 Fall;14(3):58-63. 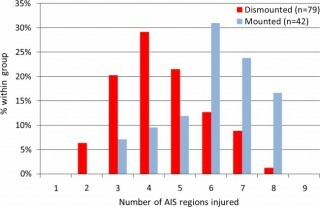 Difficile d'avoir une idée précise sur les performances relatives des matériels proposés par les industriels. Ce qui suit éclaire un peu. 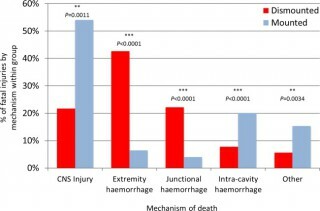 Junctional hemorrhage is a common cause of death on the battlefield, but there is no documented direct comparison for the use of junctional tourniquet models by US medics. 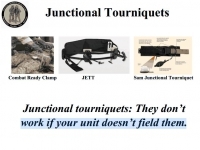 The purpose of this testing is to assess military medic experience with the use of junctional tourniquets in simulated out-of-hospital trauma care. 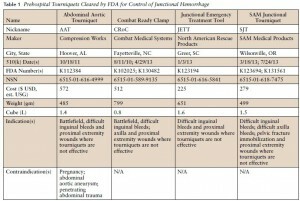 Nine medics (seven men and two women) used four different junctional tourniquets: Combat Ready Clamp™ (CRoC™; http://www.combatmedicalsystems.com), Abdominal Aortic and Junctional Tourniquet™ (AAJT™; http://www.compressionworks.net), Junctional Emergency Treatment Tool (JETT™; http://www.narescue .com), and SAM Junctional Tourniquet® (SJT®; http:// www.sammedical.com/products). 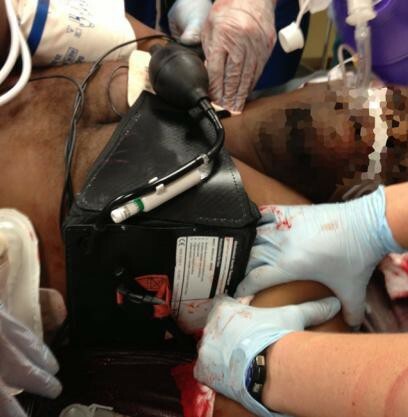 These medics also acted as simulated casualties. 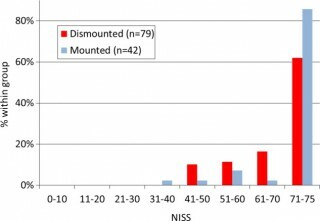 Effectiveness percentages, as measured by stopped distal pulse by Doppler auscultation, and time to effectiveness were recorded in two tests per tourniquet (72 total tests). Tourniquet users ranked their preference of model by answering the question: "If you had to go to war today and you could only choose one, which tourniquet would you choose to bring?" All tourniquets used were safe under the conditions of this study. 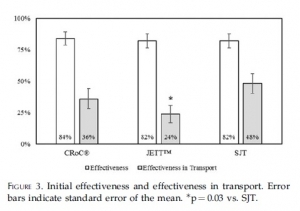 Both the SJT and the CRoC had high effectiveness percentages; their rate difference was not statistically significant. The SJT and the CRoC had fast times to effectiveness; their time difference was not statistically significant. Users preferred the SJT and the CRoC; their ranked difference was not statistically significant. Kotwal RS et Al. J Spec Oper Med. 2013 Winter;13(4):85-93. L'industrie nous propose des "garrots jonctionnels". Difficile de se faire une idée précise. Les US ont intégré le CRoC au TCCC. Cependant ce dispositif n'est pas si simple à monter. Cet article offre une lecture intéressante sur le sujet. Le tourniquet abdominal ne doit pas être appliqué plus d'une heure. Les autres le peuvent pour une durée maximum de 4 heures. 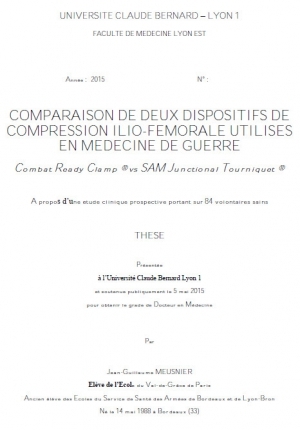 Enfin le Sam Junctional Tourniquet est homologué par la FDA en tant que ceinture pelvienne.